Sign up & send first 12,000 emails for free! 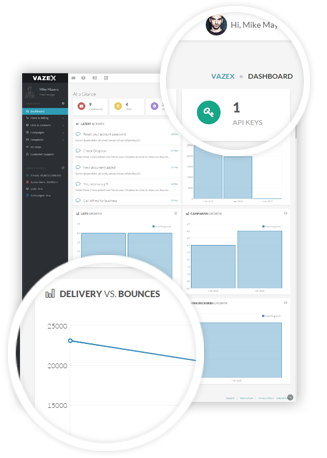 Vazex is an email marketing solution that will help you stay conected with your customers. Our panel was designed to offer a full set of email marketing tools at affordable rates. Register a free account in minutes and import 1,000 subscribers absolutely free. Follow our step by step tutorial to setup Amazon SES in minutes. Create a new list and import your existing subscribers via variety of methods. Fill out campaign details, choose your list, add content & schedule the date/time. If you're not sure what plan to choose, simply sign up & send 12,000 emails /mo for free!